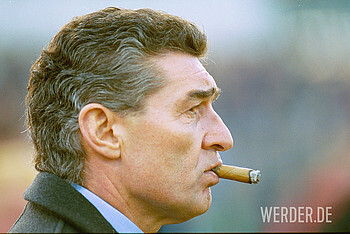 Rudi Assauer was a player, coach, and general manager for Werder (Photo: nordphoto). SV Werder Bremen mourn the death of Rudi Assauer, who passed away at the age of 74 on Wednesday. Assauer made 188 appearances for the Green-Whites between 1970 and 1976, scoring four goals. He also began his managerial career at the club. He was involved with Werder until 1981, going on to join FC Schalke 04 and becoming a club legend. Rudi Assauer played in the sweeper position for Werder and also captained the club. At the age of 32, he wrapped up his playing career and became the Green-Whites’ first full-time general manager. He did the job through some turbulent times for the club, and even had to manage the side for 15 games in the second half of the 1977/78 season. Rudi Assauer sadly passed away on Wednesday (Photo: nordphoto). Assauer led Werder to 15th place and kept the club in the league. Later, in April 1981, he brought Otto Rehhagel to the Green-Whites and thus began one of the most successful times in the club’s history, beginning with promotion from the 2. Bundesliga. “Even though his name will always be connected with FC Schalke 04, Rudi Assauer also made a name for himself at Werder and left his mark on our club,” said Dr. Hubertus Hess-Grundewald, Werder president. “His passion for football shaped his life. He was the first of many to go from footballer to the boardroom, like Klaus Allofs, Frank Baumann, or Marco Bode. Rudi Assauer still had friends in Bremen even after his time at the club came to an end, with Dr. Franz Böhmert above all,” he added. To emphasise how important Werder were to Assauer, he once said in an interview that leaving Werder to join Schalke in 1981 was the hardest decision of his career. Werder Bremen will always remember Rudi Assauer.